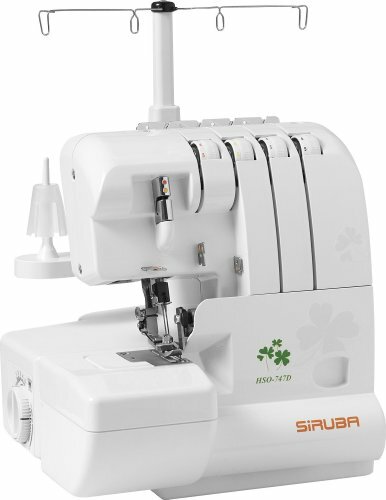 The SiRUBA HSO-747D 2 Needle-4 Thread Serger features a color coded threading chart, differential feed mechanism, free-arm sewing, and a micro safety switch. This product is easy to operate for beginners and hassle-free for sewing-lovers. The user-friendly and manageable serger features free-arm sewing, adjustable presser foot, and differential feed mechanism. To boost your creativity, it sews versatile stitches for skilled and neat finish. This serger has a micro safety switch to prevent sewing when front cover is opened. The machine adjustment chart, which is included in SiRUBA’s instruction book, will help you to sew smoothly based on stiffness and thickness of fabric, thread size and type, and the needle sizes. This product is designed for domestic usage only (120V, 60Hz). This threading chart will guide you to thread easily with color indicators. When the front cover is opened, the safety switch will prevent sewing. A differential feed adjustment knob is at the side of the serger. Differential feed allows two sets of feed teeth (one front and one rear) to move at different rates, with a differential ratio of 0.7-2.0. The differential feed can be adjusted by simply turning the adjustment knob. The support bed can be removed and converts to a free arm. This is convenient for sewing pant legs, sleeves and cuffs, etc. This feature allows you to control the tightness of threads for perfect seams. For better sewing quality on both heavy and light fabrics, the adjustable presser foot allows you to control its pressure by loosening or retightening the presser foot. The SiRUBA HSO-747D 2 Needle-4 Thread Serger comes with a tweezer, which will help you to thread easily. To adjust your sewing speed, the foot controller sews from 1100 stitches per minute (s.p.m.) up to 1500 s.p.m. A machine adjustment chart to help you to sew beautifully based on stiffness and thickness of fabric, thread size and type. Pretty good product, worker, not many bells or whistles By far the strengths of the serger include the speed (1300 spm) and the strength. It will sew all types of material, thick, delicate and several layers. This serger reminds me of a industrial machine but in a domestic frame. Threading can be a problem if you allow the thread to break and have to thread it from scratch. If it is set up properly it sews consistently and beautifully. As with most machines like this one, the manual leaves a lot to be desired. If you have used a serger before it won’t be intimidating. For the beginner it requires patience because the manual will not help a lot.